After going through and crossing over a double abyss of energies from 2017-2018 comes such insight and clarity. After we go through ‘something’ we can then raise above things more ‘healthily’ – as in not ‘get over it’ but to go through ‘it’. The ‘rewards’ or ‘benefits’ of doing just so is clearing energies or spaces or layers or doubt and super sensitivity to core of oneself in a way so deep, that is linked to family/group energies, that ‘clears’ a New Path of a New Birthing within a re-birth of energies. Of being able to now see more fully the bigger picture of an ‘old role’ that we were in. Of seeing and feeling from a new and different vantage ‘point’. Or in seeing and feeling a bigger bigger picture with others…as in those close to us who were once in our circle of family energies. As this too has ‘changed’. So many ‘lines in the sand’ have been drawn energetically that now allows one to ‘see’ more of a bigger picture and therefore allows one to create a newer way to cope and live, with those we have close souls contracts with or our heart ‘strings’ are linked with. Of souls who we were closely linked with and still are, yet for us, in a new and different way. And in this ‘new and different way’ there are more or newer and a little (or a lot) different boundaries or ‘ways’ that one now finds to ‘cope’ with those souls. No matter what the or a connection with others, it is about finding a newer way to see and feel in a different way or vantage ‘point’ energetically. 2018 brought through a new re-structure of a new energy re-set that was not expected for those who feel so deeply. Yet there are those or many that only felt/a the smoother transition into 2018. Those who feel so deeply at their core as deep transmuters for and with humanity as their ‘role’ with humanities ascension did feel so deeply and were very ‘affected’. These souls will have greater shifts for themselves…the very strong, yet very empathic. Those who others did not understand or were viewed by others as ‘oh that’s just them over-reacting again’. These are the souls that are now more deeply finding who they really are! Those who have carried such ‘burdens’ of generational energies that they have been transmuting. Of releasing the old links and ties and wounds often from their first incarnation! Those of you who have been on their journeys ‘for a while’. As ‘the higher we climb, the more we see’. It is a very different vantage point when one has traversed the long hard ‘slog’ at times and who have pushed through to their sovereignty and uniqueness. As sometimes it can take a little while to do so. As many are changing the world within themselves which then flows out and follows to the rest of humanity in following themselves! Being a seeker of ones soul is such a very brave ‘thing’ to do. When one faces and really faces ‘head on’ what our ‘heads’ and stubbornness of our ego have held onto so fiercely for so long to cope. The follow through of the ‘knowing’ in a very new and very different way. Of a New Birthing within a new re-structure and re-set energetically. So too did we also feel this deeply within. For those Brave Spiritual warriors I ‘salute’ you. We have made it, we have come so far. The rest from here is really ‘up to us’. And now the energies ARE HERE with 2018 to re-create a very new template within ourselves for all else to flow and follow outwards from inwards. 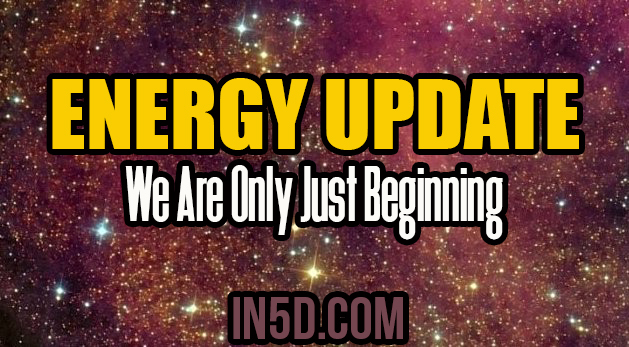 We are only just ‘beginning’ in a very new and a very super heightened energy of our planet! We are Master Creators of so much abundance in all and every way. Again, we are only just beginning.